This workshit is useful for beginners in learning English. It contains the information how to write the date correctly. 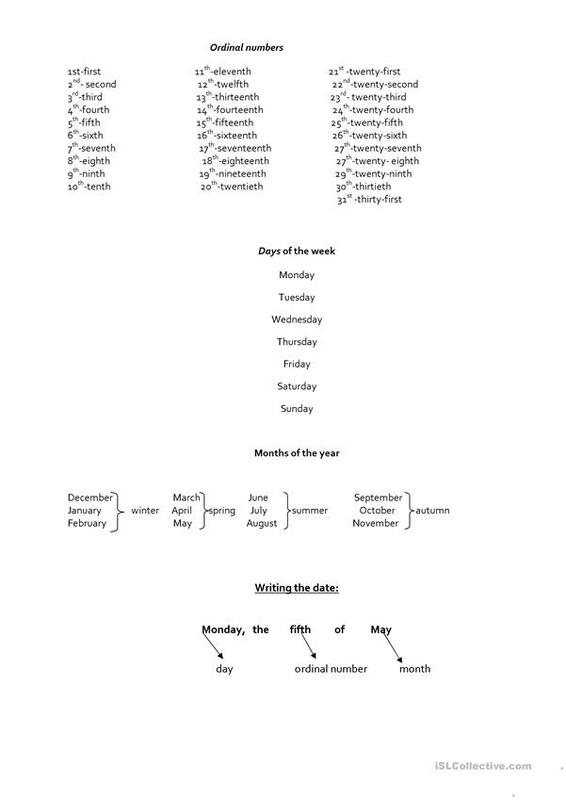 There are ordinal numbers, days of the week and months of the year. This downloadable teaching material is meant for elementary school students at Beginner (pre-A1) and Elementary (A1) level. It is a useful material for consolidating Numbers: Ordinal numbers in English, and was designed for improving your pupils' Writing skills. It is focused on the theme of Days of the week. galic is from/lives in and has been a member of iSLCollective since 2014-10-06 23:53:03. galic last logged in on 2018-11-07 23:32:21, and has shared 1 resources on iSLCollective so far.